1. Color – Consider a color palette that has at least two colors with a gold or silver accent color. Stay away from colors that do not compliment each other well. Keep in mind the venue and if there are elements that cannot be changed. Watch out for Pantone color trends for the time of your wedding. 2. Monogram – Take a monogram and put it on your menu cards and programs for instance. 3. 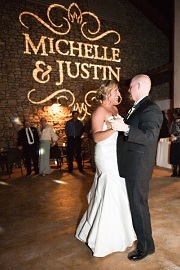 Lighting – Take the monogram further and add a gobo monogram to your ceremony and/or reception for an added touch of upscale. Also, consider up-lights in areas, especially for venues in which you cannot add anything to the walls and besides, who has the money to shell out for drapes if you are on a budget? 4. Venue – Check out venues that have a background or setting that would need minimal decorating to save money. 5. Place setting – Add a colored charger for under $2 a piece to add to reception tables. At Event Loft, we can help you plan and design an inexpensive wedding and make it look upscale. Give us a call and let’s get to work! Serving Philadelphia, PA and surrounding areas.